You can find almost anything on Pinterest…it’s true. 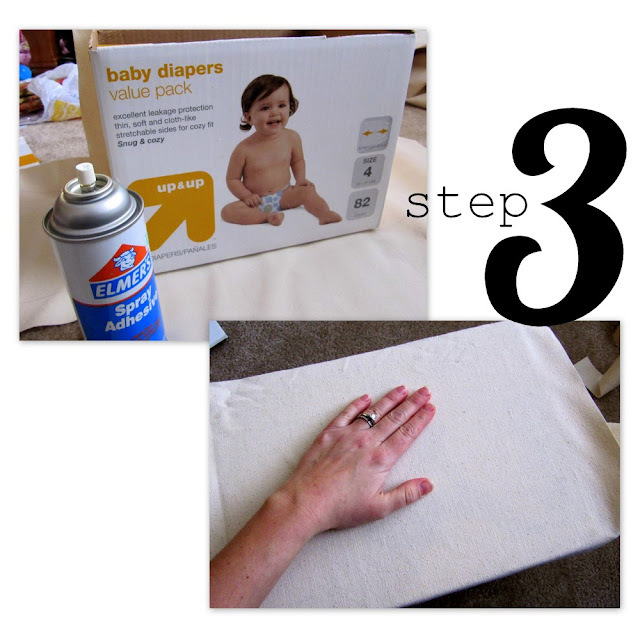 Upon wasting my time searching the other day, I found a fantastic tutorial on recycling diaper boxes. Hmmm…what could I do with this? Oh, yes – toys scattered all about our living room floor: check, a desire to get said toys put away when not in use: check, cute fabric laying there staring at me: check! I decided to take on this project! Cut the flaps off off your box. Flip your box over and use your measuring tape to measure up one side of your box, over the narrow bottom width and then down the other side, as shown. Write down this width measurement. Now, rotate your box and take the box’s length measurement in the same manner. 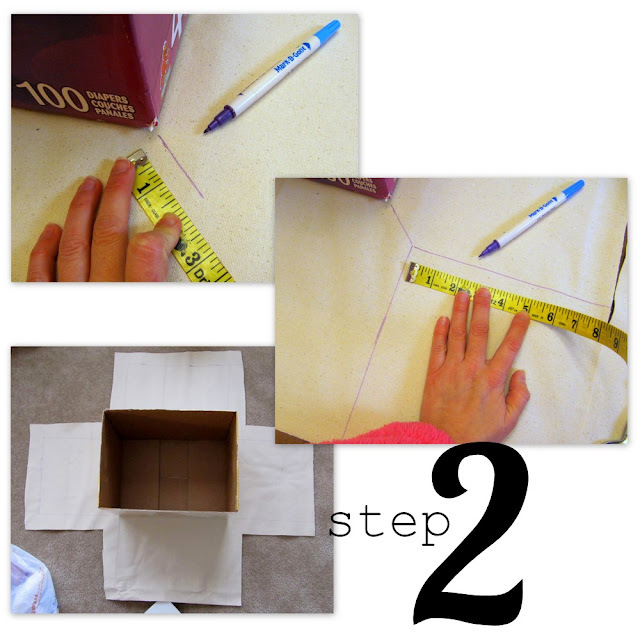 Cut a piece of your canvas fabric that is your width measurement by your length measurement. Lay your cut piece of fabric on a flat surface, and place your box on top of it, so it is precisely centered on the fabric. 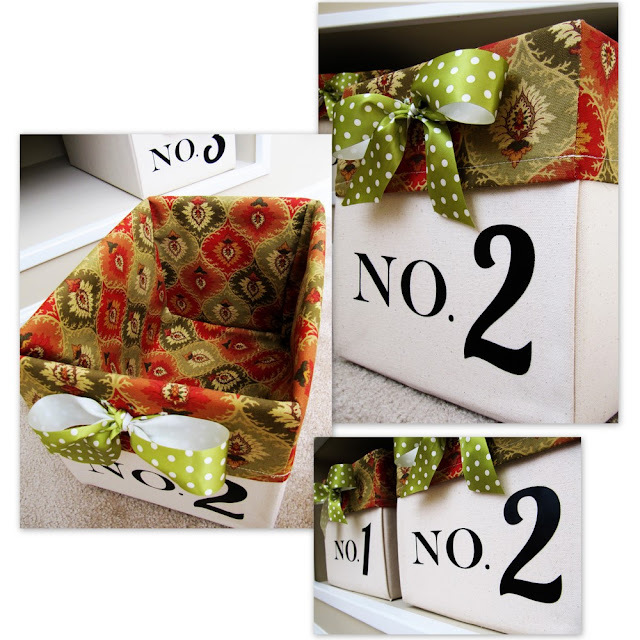 (Make sure the long sides of your box is aligned with the long sides of your fabric piece.) Use your measuring tape and disappearing ink marker to mark a line out 2 inches out from one of the corners of your box, as shown. Now, mark a line out from the bottom of the mark you just made that is perpendicular to the raw outer edge of your canvas piece, as shown. Repeat with the remaining three corners of your box. Cut along all of these lines, so that you are left with a cross-shaped canvas piece, making sure to cut along the angled corner lines, as well. 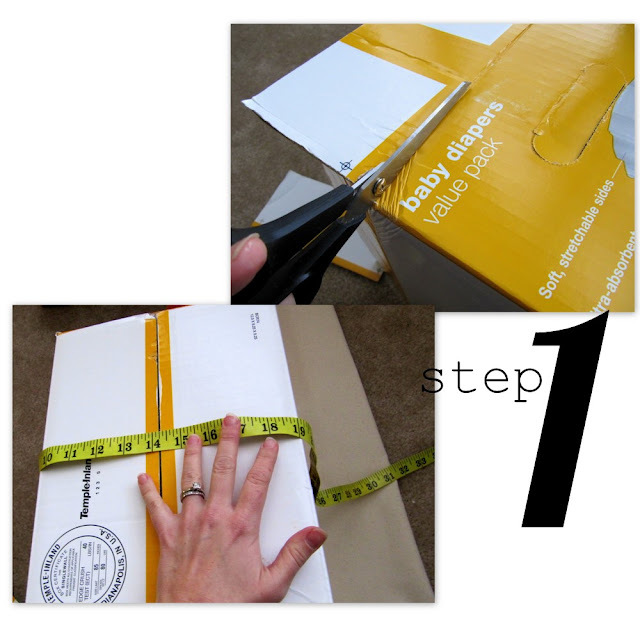 Apply a thin, even coat of spray adhesive to one of the long sides of your box. 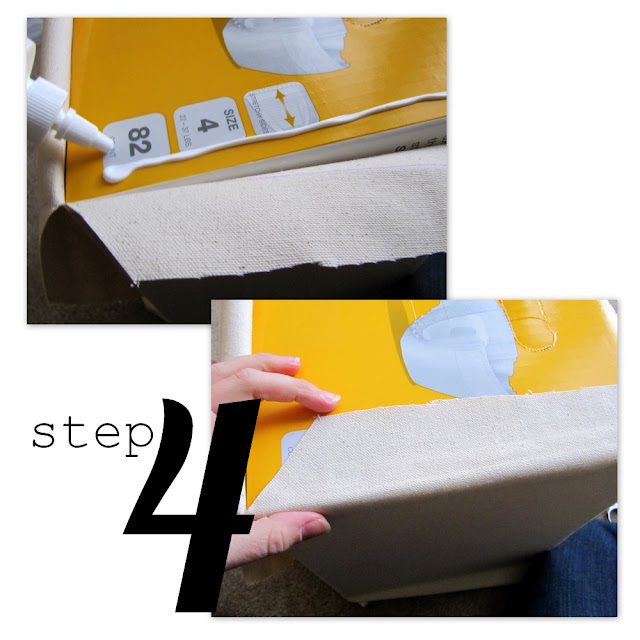 With your box precisely centered on your cut piece of canvas, fold the corresponding canvas flap up and over the box, pulling the fabric to ensure it is snug and your bottom edge is crisp. Use your hand to smooth out any bubbles. Repeat with the other long side. Working on one of the short sides of your box, apply an even line of glue to one of the outer edges, and fold over the corresponding flap snugly to adhere it to your box. Make sure to pull enough so your edges are crisp! Repeat this step for the remaining flaps on the short sides of your box. Apply an even line of glue on either side of your remaining short flap, as shown. Fold in and adhere the outer edges of the flap so that the creases formed are in perfect alignment with the outer edge of your box, as depicted below. (Once these outer edges are folded in and adhered, your flap should be precisely the same size and shape as the short end of your box.) 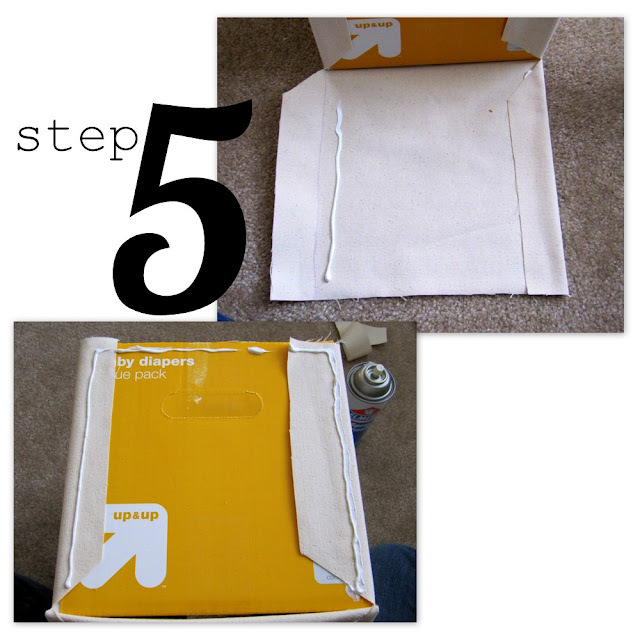 Apply glue to the top and sides of one of the short ends of your box, and then snugly fold the flap of fabric up and over this side, making sure everything is smooth and even, and that you have a nice, crisp corner at the bottom edge. Repeat with the other flap on the opposite short side of your box. If at this point the edges of your fabric aren’t exactly aligned with the top rim of your box, don’t worry! The liners to make will cover up this part of the box. If the canvas sticks up taller than the rim of your box, though, I do recommend that you trim away the excess so that you liner will fit your box properly. 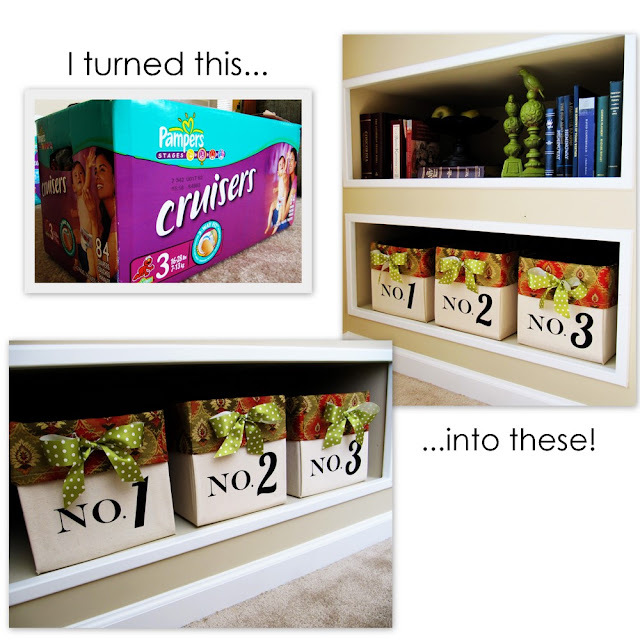 Use the basket liner tutorial of your choice to make liners for your bins. There are so many great tutorials out there! For this set of bins, I used this tutorial from Make It and Love It, with the following modifications: instead of creating a casing as the tutorial details, I simply hemmed the edge of the liner, and then I added two button holes to the center front of each liner to thread a piece of coordinating ribbon through. 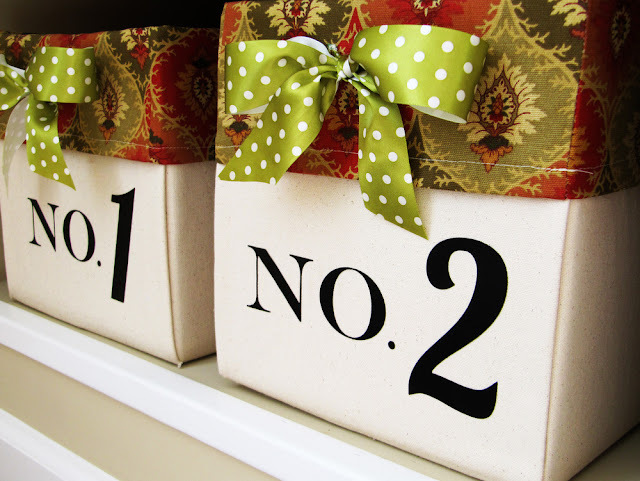 Use your die cutting machine to cut coordinating numbers and/or letters from your vinyl to label the front of your bins. I labeled mine Nos. 1 through 3, but another great option would be to make a label to indicate the contents of each bin (movies, games, etc. ).